The wonderful people from Soane in London came to see us two weeks ago. I love Soane. They have such beautiful things. I can’t count the number of times I’ve used the Petal Wall Light. As usual, I found so many good things for jobs on which I am working. Just as they were leaving, they mentioned to me that they were taking a week in Barbados before going back to England. I love, love, love Barbados. I used to go there to stay with a wonderful couple (Mr. and Mrs. Miles Warner whom I called Madame Queen and The Kingpin—believe me, their names fit!!!) and their beautiful daughter, Jane, and her equally beautiful Norwegian husband, Axel. We stayed in a fabulous house they had built called “Jane’s Harbor”. 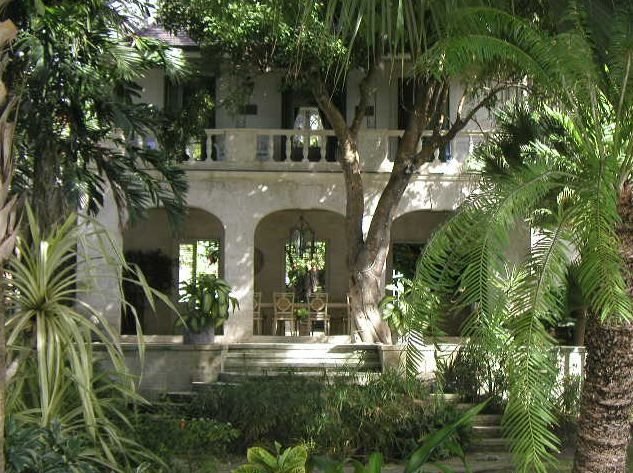 It was an Oliver Messel house, and it had a wonderful, mysterious, almost shabby quality, with old faded slipcovers and vines creeping into the always open-to-the-air rooms, and lots of little lizards scampering around. Oh, I loved it. 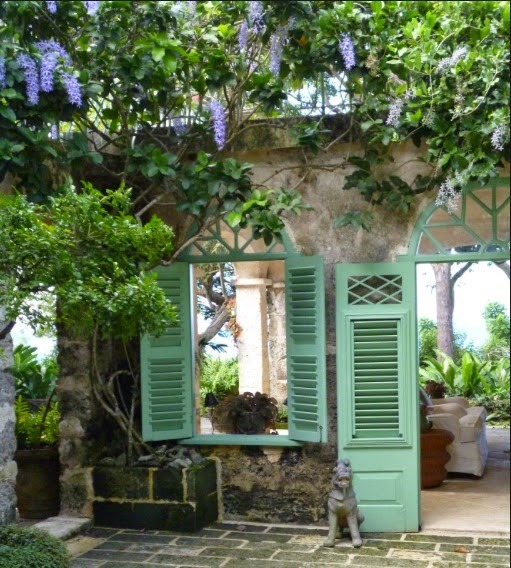 The house was built in a giant Square C around a lovely garden with roses and petrea hanging from the stone arches. All of our meals were served in the long, also open-to-the-air dining room with white garden furniture and bouganvilla blossoms scattered on the table tops along with all the beautiful old porcelain plates and crystal glasses—masses of them for all the wines we drank!—and lovely old burnished silver. 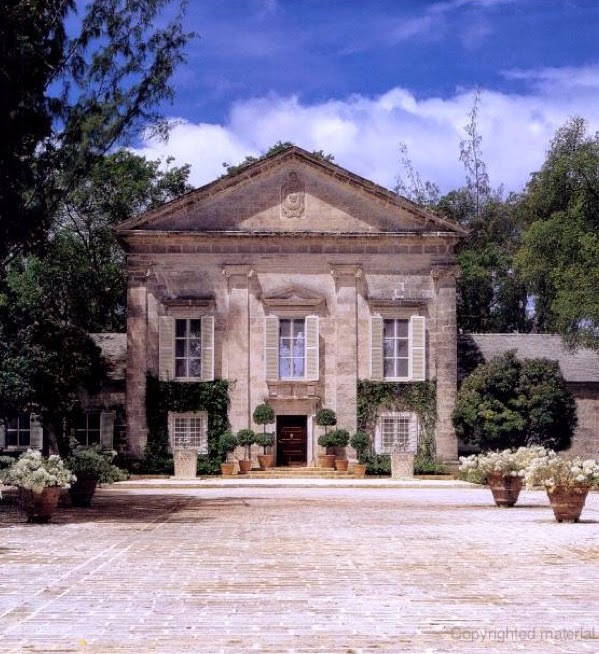 We played tennis on the court that Miles had built, sat on the wonderful Sandy Lane beaches (Jane’s Harbor was built on land, some of which was sold to make the Sandy Lane Hotel), and stayed up and talked late into the night because we knew we could sleep-in the next day. Sadly, the house has changed hands, and today you can go stay in it for $7,500. a night, and I suppose it s very nice, but the mysterious charm is gone. Like so much of what is done to suit the New World Travelers, charm leaves to usher in very clean, stark rooms with oversized new rattan and bedrooms where you better take lots of your own photographs and accessories to make it look a little more “inhabited”. It doesn’t look anything like Oliver Messel anymore and there is a huge pool in the middle of the old garden surrounded by hideous dark chaises and umbrellas. Oh my! Oh my! The home of Sir Ronald Tree and my (far-removed) cousin, Nancy Lancaster ,which was not an Oliver Messel house, but rather was designed by Sir Geoffrey Jellico, but which has so many of the wonderful, casual but unbelievably dressy details that went with life in the resort homes of the 60’s and 70’s and early 80’s. 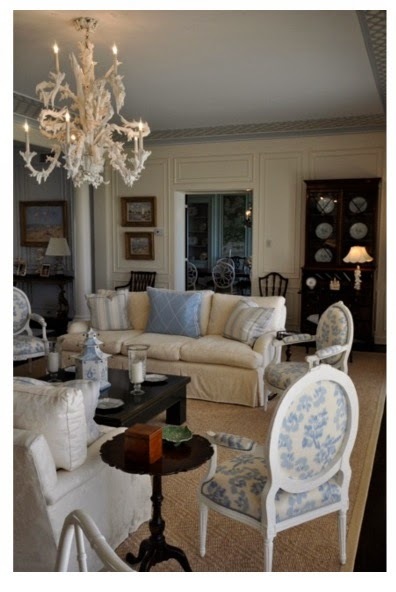 The interior below shows what the rooms were like—all over Barbados—you will notice a certain almost cluttered look of smaller furniture and white slipcovers mixed all in with wonderful antiques and bibilots. We went to Fustic House, now, sadly, redecorated (although nicely), but still with the Oliver Messel details of woodwork in Messel Green, a lavish use of coral stone, open air doorways and windows and tropical flowers and foliage everywhere. 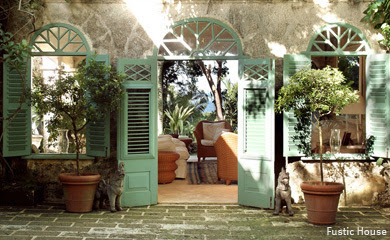 One of the things Oliver Messel did was to have winding verandas and little not-quite-secret spaces. 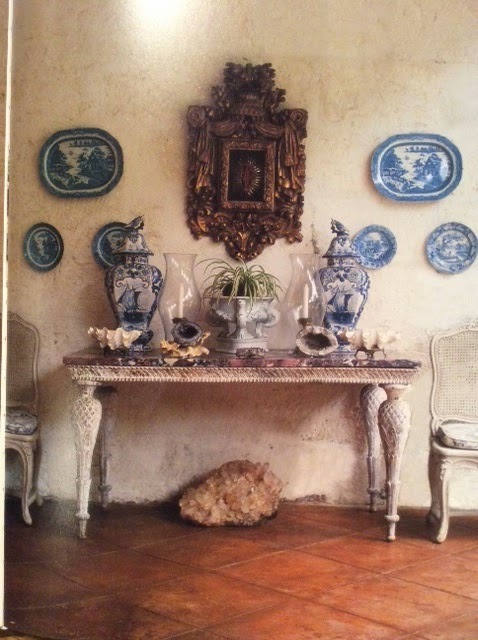 We went to Maddux House—Madame Queen knew everyone—one of the great coral stone houses with classical proportions and glorious tall rooms and creeping-in tropical foliage everywhere. Oliver Messel was obviously a genius, as is his nephew, Thomas Messel, whose furniture and lighting fixtures are perfect in these Palladian influenced buildings—or your own Palladian villa—as in this sea life chandeliere which we used in a classical house on the ocean. 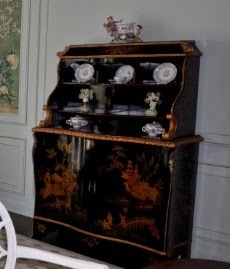 And you can see the fine sense of symmetry and attention to detail, surely inherited from his uncle, in this lac de chine console/cupboard made for a client’s collection of English porcelain. 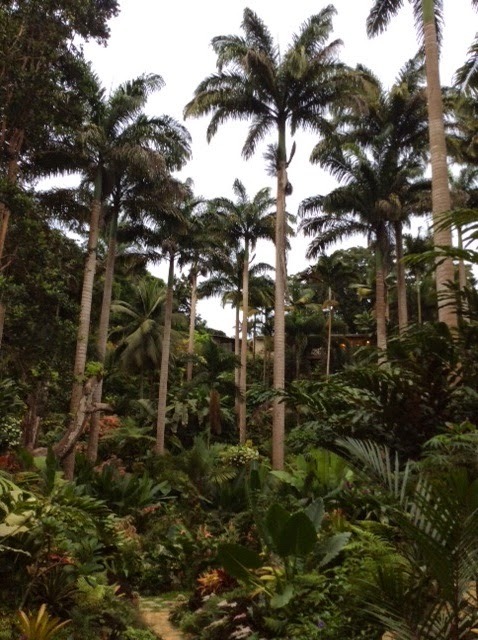 The wonderful people from Soane, Lulu Lytle and her six-year old son, sent pictures back to me from Barbados. In the first, you can see that “old” quality in this romantic arrangement against a coral stone wall, and in the second, just revel in the natural beauty of this loveliest of Caribbean isles. There are several companies in America who either represent or produce Oliver Messel “products”. You could use Farrow and Ball “Breakfast Room Green” for you trim colour on trelliage and railings. It looks a little yellow-y in my computer, but it is not. 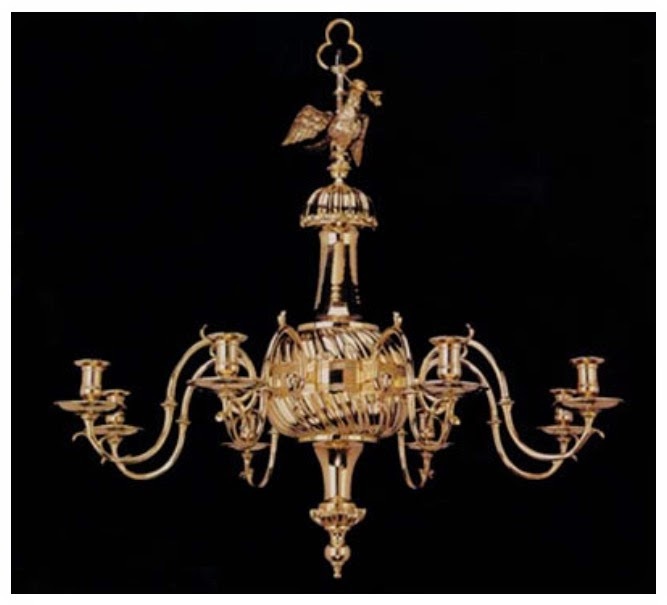 You could use Price Glover in New York City to make you wonderful brass chandeliere such as Oliver Messel loved. 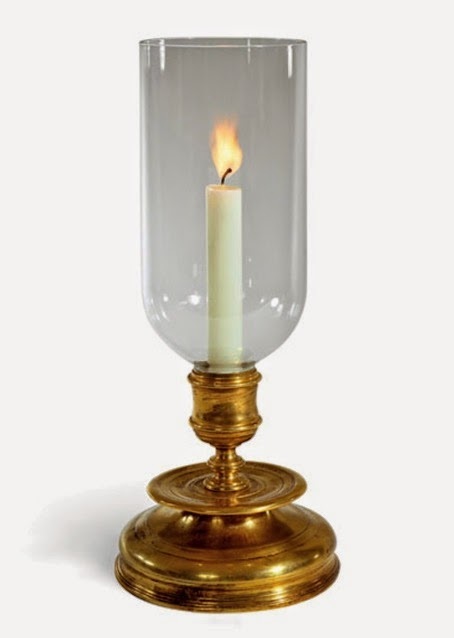 You could even use the beautiful, beautiful Veranda lamps from Soane. And you could get some of Bennison’s “faded” linens—make sure you specify that they are to be the faded version. Good choices might be “petite fleur” or “Liliana” in the faded versions. You will need to go to one of their showrooms to see them, because all of the images on the web are in the non-faded version, but you definitely will feel that the trip was worth your while.